VGo can save schools hundreds, even thousands of dollars by changing the way that they educate homebound students. Here are a few examples of how schools are using VGo to save on homebound instruction. For some students, attending school isn’t possible. Injuries, extended illnesses, immune deficiencies, extreme allergies, teen pregnancies and other physical challenges as well as disciplinary actions can all prevent a student from physically being able to attend school. With VGo, students with healthcare needs can received the same education as their peers - participate in classroom discussions, group projects – even field trips, as well as share in the social aspects that school provides through interaction with friends, peers and teachers – all for a fraction of the cost of tutoring. The Delaware-Chenango-Madison- Otsego (DCMO) Board of Cooperative Educational Services (BOCES) is a regional educational agency providing services in partnership with 16 local school districts. It is one of 37 across New York State working in collaboration with their local school districts to offer programs to students and teachers, as well as administrators, and the community. DCMO BOCES purchased three VGos for students and teachers with healthcare needs to still be present in the classroom. 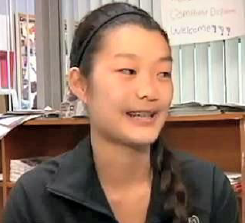 After facial reconstructive surgery, Shanalin, a senior at Afton Central School was homebound for five weeks while she recovered. Traditional homebound instruction would have provided her with a tutor 5 days a week for about 2 hours a day. At $50 an hour, the cost for tutoring would have been $500 a week - $2,500 for her five week recovery time. Phil Sheridian, Director of Technology at DCMO BOCES says that no tutor is effective across 3-5 subjects and students often come back from short-term illnesses well behind their classmates. Since Shanalin was taking an advanced calculus class, there was no tutor available to keep her up with her classmates. Videoconferencing can be a solution, but it’s not always available and can be costly. Low cost solutions like Skype still require that someone other than the distant student be continuously responsible for the Skype enabled PC or Laptop. Someone has to be there to establish the connection, the student’s view is limited to where the camera is pointing and someone has to adjust speakers and microphones, etc. Plus, it is limited to just the classroom. There is no social interaction with friends and teachers on the students own terms. Patched together solutions don't have the required functionality for the student to be able to fully see everything and also can fall over, leaving the student stranded. 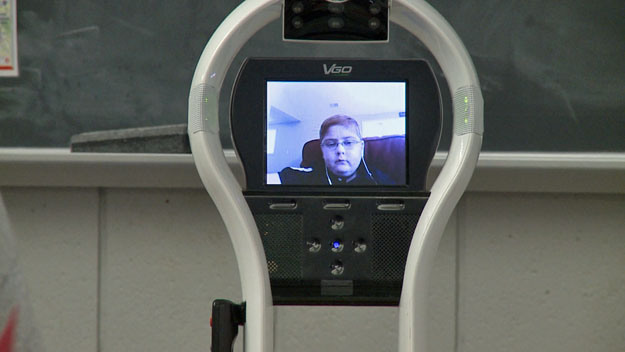 VGo for Remote Students has opened up academic and social environments to medically frail students as well. There are no longer boundaries between them and the world that was previously inaccessible. VGo is simply controlled by an internet connected computer or iPad so the student can be anywhere – recovering at home, or while receiving treatment in the hospital. “I was able to see all the lesson materials on the board, and was still able to communicate with the class and the teacher,” says Shanalin. With VGo, she was able to keep pace with her classmates. “Shanalin is a very motivated student, but not all kids are… for some students, if they get behind, they’ll never catch up. “Physically they are better, but academically they are behind and don’t recover,” says Sheridan. VGo can be used by multiple students during the school year – even the school day thanks to easy-to-use scheduling in the software’s management system. VGo is affordable so it can be available to school districts seeking a solution for homebound instruction – at less than $5,700, DCMO BOCES has the VGo nearly half paid for after just 5 weeks, plus Shanalin was able to keep up with her Advanced Calculus class, and all the rest of her classes, too. VGo made it easier on everyone – teachers, friends, and parents, and of course, Shanalin. “It just works,” says Sheridan. Tyngsborough High School (Tyngsborough, MA) has approximately 520 students, and is part of the Tyngsborough School District. The district purchased a VGo for students with healthcare needs to still be present in the classroom. Connor Flannagan, 14, was diagnosed with leukemia in 2005. He endured a bone-marrow transplant and spent months on end in and out of doctors' offices. 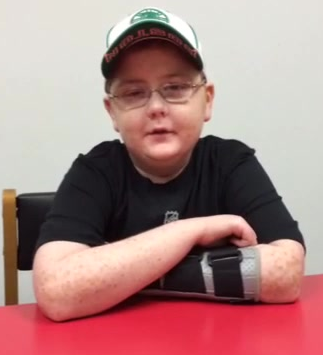 Since about 2007, Connor Flanagan has made a full recovery from his cancer diagnosis. But in 2012, he continued to suffer from chronic lung failure and eventually needed to have a double lung transplant. He beat the leukemia and recovered from that major surgery, too. Then, earlier this year, he broke his hip and needed surgery. Through it all, Connor has stayed positive, but had always been isolated from school. His medical challenges have left him weakened. He gets winded easily, is prone to infection, and doesn’t have the stamina to attend school five days a week. “The school system was willing to send a tutor, which would be academically fine but he would be missing the whole piece of seeing classmates and interacting with them,” says mom Jennifer Flanagan. 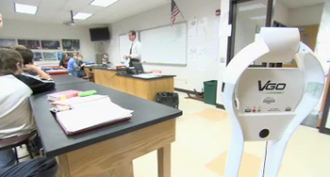 While the district could have provided a tutor for Connor, it would have cost $200-300 a day. 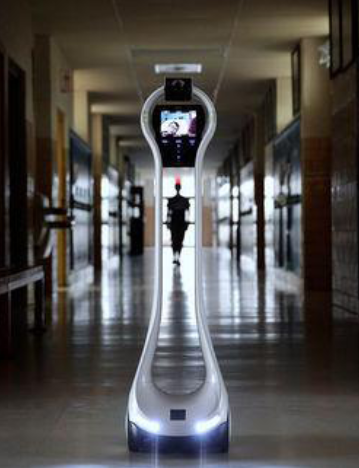 With VGo, Connor can see, hear and move around in his classrooms and in the hallways. It’s just like he is there in person. Cassie Wayne, Flanagan's lab partner, explains what it is like to work with him remotely. "He can see most of the things, he can do almost anything," Wayne said. The VGo can be shared by other students with special health needs through the management which allows the school to control which student has access at difference times of the day. VGo has opened up academic and social environments to medically frail students as well. There are no longer boundaries between them and the world that was previously inaccessible. VGo is simply controlled by an internet connected computer or iPad so the student can be anywhere – recovering at home, or while receiving treatment in the hospital. VGo was chosen as it is the only solution to have the required functionality for the student to be fully engaged to participate in classroom discussions, group work - even lab projects! VGo is also the optimal solution for students - it is the right height and has the stability to avoid falling over. VGo is affordable so it can be available to school districts seeking a solution for homebound instruction. In this instance, Tyngsborough saved more than $1,000 a week and the VGo was paid for in about 6 weeks, plus Connor is so connected with his classmates, that he was even elected Class Vice President! Want more information on how VGo can help your homebound students? Click here to find out what educators are saying about VGo. Download our white paper here to learn more about how VGo enables students with special health needs to attend school.